Burnt Cheese Press, 9780996911207, 188pp. 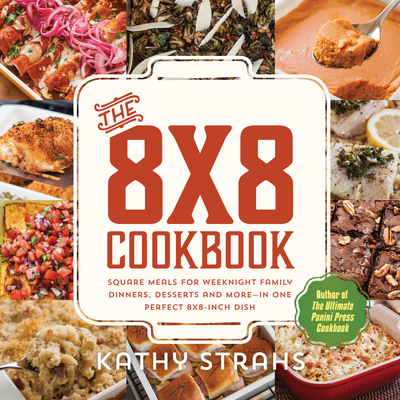 This cookbook elevates the simple 8x8-inch square baking dish into a dinnertime secret weapon for busy families. Beyond the usual brownies and casseroles, the book shows 64 modern "square meals": easy weeknight one-dish meals such as Honey-Glazed Chicken with Root Vegetables, Sunday dinner recipes like Spinach-Pesto Lasagna, tasty recipes for sides such as Chard Apple Stuffing that would make a nice addition to the Thanksgiving table, brunch fare including Orange Custard French Toast, and Croissant Bread Pudding with Espresso Butterscotch Sauce for dessert. Kathy Strahs is the voice behind the blogs Panini Happy and Cooking on the Side. She is the author of The Lemonade Stand Cookbook and The Ultimate Panini Press Cookbook. She lives in Los Gatos, California.